From Stories of Shakespeare's Comedies by Helene Adeline Guerber. New York: Dodd, Mead and company. This philosophical remark amazes the Duke, who inquires what the Syracusan's life has been, seeing he seems glad to lose it. In reply, Egeon states that, born and married in Syracuse, he removed to Epidamnum, where his wife gave birth to twin sons, on the same day that a slave woman was similarly blessed. The merchant's sons proving so exactly alike that no one could tell them apart, he gladly secured as attendants for them the twin children of this slave, because they, too, were exact counterparts. Shortly after making this purchase, the merchant, his wife, and the four small children set out for home, only to be overtaken by a tempest, during which the crew deserted them on a dismantled ship. Forced to provide for the safety of his helpless family, the merchant bound his younger son and slave to a mast with his wife, attaching himself to another with the two elder children, just before the vessel broke up. Although they now drifted apart, Egeon saw his wife and the children with her rescued, ere he was swept away to be saved later by another ship, which brought him to Syracuse. Notwithstanding constant efforts since then to discover traces of wife and missing children, the merchant has heard nothing of them. When eighteen, his sole remaining son insisted upon going in search of them, accompanied by his servant, equally anxious to find a twin. Receiving no tidings of these travellers, Egeon followed them two years later, and, after vainly journeying about five years, landed in Ephesus, convinced of the loss of all he held dear. Touched by Egeon's sad story, the Duke says he would gladly free him, did not the law forbid; all he can do is to allow the Syracusan to scour the city in company of an officer, in hopes of raising the sum necessary to save his life. In the next scene Antipholus, eldest son of the Syracusan merchant, just landed in Ephesus with his attendant Dromio, is met by a local tradesman, who charitably warns him not to reveal his birth-place, lest he, too, forfeit his life like the traveller to be executed at sunset. Instead, he bids the young Syracusan state he came from Epidamnum, advice which Antipholus gratefully promises to follow. Then, turning to his servant, he bids him go to the inn, entrusting to his keeping all his fortune, and promising to join him there when he has viewed the town. 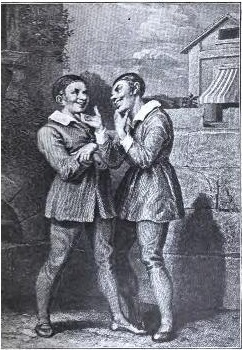 While standing on the market place, he is approached by a man, so similar in appearance to his own servant Dromio that he naturally mistakes him for his slave. This is, however, the second slave, also called Dromio, who has lived with his master in Ephesus for many years. When the Syracusan master hails the Ephesian servant, asking why he has returned, this man, mistaking him for his employer, volubly bids him hurry home to dinner, for his mistress impatiently awaits his return. Deeming this part of the fooling in which his servant indulges to divert him, the Syracusan, who is in no playful mood, bids him desist, and explain instead how he disposed of the money entrusted to him. Imagining his master refers to a sixpence given to pay a bill, the Ephesian servant vows he has delivered it to the sadler, a statement the Syracusan regards as humorous evasion. But when the servant repeats he should hurry home to his waiting wife, Antipholus becomes so indignant that, although Dromio ruefully asserts his mistress has already beaten him, he receives a second chastisement. To avoid further blows poor Dromio now runs away, while the Syracusan mutters he will have to hasten to the inn to make sure his money is safe. The second act opens in the house of Antipholus, the Ephesian, who bears the self-same name as his brother, just as his servant bears that of the Syracusan slave. For some time past the Ephesian has dwelt in this house with his wife, a wealthy woman called Adriana. Conversing with her sister, this lady impatiently wonders why her husband doesn't return, and what has become of the servant sent to get him. Her sister, Luciana, urges some merchant may have invited her brother-in-law to dinner, adding, to comfort the fretting wife, that men must be allowed some latitude. When Adriana tartly inquires whether that is the reason why she has hitherto declined to marry, Luciana retorts that she will never do so until she has learned to be patient with a man's vagaries. Such statements, however, fail to appease Adriana, who bitterly remarks it is easy enough to be patient in regard to the shortcomings of some one else's husband! They are still arguing when Dromio returns. Asked whether he has delivered his message, and why his master doesn't appear, the servant ruefully describes how he was received, vowing his master spoke of nothing but gold, rudely exclaiming when he mentioned his mistress 'I know not thy mistress; out on thy mistress!' On learning that she has thus been denied, Adriana, feeling sure her husband must be in love with some one else, orders her servant to bring him home immediately, under penalty of a whipping. The Ephesian Dromio has barely gone, when Luciana tells her sister that if she allows angry passions to distort her features, she will soon become homely, only to hear that it is impossible to refrain from anger and jealousy under such circumstances as these. Adriana then adds she would gladly forfeit the golden chain her husband promised her, were he only safe at home, showing such grief that she leaves the room weeping, while her sister comments upon the folly of jealousy. Antipholus, in spite of the man's evident surprise, reproaches him for pretending a while ago that his wife wanted him to hasten home to dinner. But the man truthfully denies all this, vowing he has not seen his master since he left him to carry the gold to the inn. In his anger at what seems wanton evasion, Antipholus beats Dromio, saying that, although he occasionally condescends to jest with him, he refuses to be mocked in serious moments. The misunderstanding between master and man continues, neither suspecting there are in this town two masters and two servants, bearing the same names and looking exactly alike. They are still disputing when Adriana and her sister burst upon the scene. Taking the Syracusan for her husband, Adriana, calling him by name, hotly reproaches him for not coming home on time, and for publicly denying her existence. In her jealousy, she accuses him of forgetting her for the sake of some other fair dame, a reproach which amazes the Syracusan, who gravely assures her that never having seen her before, and having been in Ephesus only two hours, he doesn't understand what she means. Such a statement, considering his exact resemblance to the Ephesian Antipholus, causes Luciana indignantly to exclaim that he should treat his wife with more respect. On hearing that Dromio, whom, of course, he deems his servant, was sent to summon him home, only to be ill-treated, Antipholus is nonplussed. He, therefore, questions the man, who truthfully denies ever having seen Adriana, a statement she and Antipholus refuse to credit, the latter on account of the message brought a while ago. Sure now that both husband and slave are in league against her, but determined not to lose sight of them again, Adriana exclaims, 'Come, I will fasten on this sleeve of thine: thou art an elm, my husband, I a vine,' using such eloquence and determination that the Syracusan, fancying there must be some truth in her statement, and that he married her in a dream, prepares to yield. When Luciana bids Dromio hurry home, he crosses himself, wildly muttering that witchcraft is at work, and it is only after his master has certified that he still bears his wonted form, that he feels sure he has not been transformed into some strange creature. The persistent Adriana now leads Antipholus home, charging Dromio to mount guard at the door, and not admit any one, hinting that he can atone for previous misconduct by implicitly carrying out these orders. It is in a state of bewilderment that the Syracusan accompanies his wife and sister-in-law, while his servant decides to obey orders and play porter. The Syracusan Dromio is behind the door, when the Ephesian master arrives with his servant and a couple of merchants whom he has invited to dinner. After explaining that they must hurry, his wife being irritable when he is not punctual, the Ephesian begs one of the guests explain to Adriana that the delay occurred because he was so anxious to bring her the promised golden chain, which can be ready only on the morrow. He then reproaches Dromio for saying he has already called him twice; whereupon his man ruefully cries that were his skin parchment and the blows received ink, he could prove by his master's own handwriting the truth of his words. Not guilty of having beaten Dromio, the Ephesian resents this accusation, and knocks loudly on his door. Instead of admittance, he and his servant are jeered at by the Dromio within, who, boldly giving his name, calls himself Antipholus' porter, stating he is guarding the door while his master and mistress dine. The conversation between the real master and servant without, with Dromio within, fairly bristles with misunderstandings, the noise they make finally bringing maid and wife to inquire what it means. Both women are so sure Antipholus and Dromio are with them, that they indignantly refuse to admit any one else. Thus locked out, master and man threaten to break in the door, desisting only when one of the merchants suggests such a proceeding would cause vulgar comment and cast a slur upon the Ephesian's wife. In his anger, however, the husband swears he will punish Adriana, by dining at the inn with some courtesan, upon whom he will bestow the golden chain which he bids the goldsmith bring when he sups with him that evening. The next scene is played in the Ephesian's house, where Luciana, left alone with the Syracusan, reproaches him for cold behaviour to his wife, telling him that, although he wed her sister for the sake of her fortune, he should atone for the anxiety she has just endured by a few caresses. Her gentle pleading fascinates the Syracusan, who, although not attracted by his brother's wife, is greatly charmed by her sister. Seeing he persists in complimenting and wooing her, Luciana, deeming it a mark of disrespect to her sister, refuses to listen when he exclaims, 'Thee will I love and with thee lead my life: thou hast no husband yet nor I no wife.' Instead, she volunteers to fetch Adriana, so they can make friends. His servant having gone, the Syracusan vows he, too, would fain flee from the wife claiming him, although he is so deeply enamoured with her sister, that he has to defend himself against her charms as from a mermaid's song. It is while he is alone that the goldsmith enters, calling him by name, and delivers the golden chain. Amazed at receiving such a gift, the Syracusan asks what he is to do with it, whereupon the goldsmith states he ordered it, and departs, adding he can pay for it at supper. The Syracusan wonders over this episode, and over the many strange happenings of the day, ere deciding to hasten to the market-place, where his servant will meet him as soon as he has made arrangements to sail. The fourth act opens on the public square, where a merchant accosts the goldsmith, claiming the immediate payment of a debt, as he wishes to leave that day. Although not denying the debt, the goldsmith does not at present possess the necessary sum, but says he can easily obtain it from Antipholus, who owes him such an amount for a golden chain. He, therefore, volunteers to go in quest of this customer, accompanied by the merchant, who does not wish to lose sight of him until the money is paid. These two soon perceive the Ephesian and his servant returning from the inn, and overhear the master state he is on his way to the goldsmith's, bidding his servant go and purchase a rope's end, with which to beat the saucy servant who locked them out that noon. The Ephesian Dromio has just departed on this errand, slyly hoping to wield the rope himself, when Antipholus accosts the goldsmith, reproaching him for not having brought to the inn the golden chain. Unable to understand such a reproach, after having himself placed it in Antipholus' hand, the goldsmith demands the immediate payment of his bill, so he can rid himself of the merchant's company. Instead of dispensing the expected sum, the Ephesian bids the goldsmith claim the money from his wife in exchange for his chain, although the distracted artist insists he has already delivered it. When the Ephesian denies it, he incurs the contempt of both his interlocutors, and contradictory statements result in a quarrel, wherein the merchant finally calls for an officer to arrest the goldsmith an insult the latter immediately avenges by having Antipholus taken into custody, too. The double arrest has just occurred when the Syracusan servant returns from the port. Not knowing there is another man in town just like his master, this Dromio hastens up to the Ephesian to report that they can sail immediately; but whereas he expects praise for diligence, he is hailed as a madman, the Ephesian hotly denying having sent him on any other errand save to purchase a rope. Not allowed to pause long enough to sift this matter to the bottom, the Ephesian, led off by the officer, calls to Dromio to hurry home for the purse of ducats in his desk which will purchase his release. Left alone on the square, desk key in hand, Dromio debates whether he dare return to the house where the fat cook claims him as husband, but after some cogitation, decides 'servants must their masters' mind fulfil,' and hurries off in quest of the money to free the Ephesian. Their conversation is interrupted by the arrival of the breathless Dromio, bringing the key and demanding the money to free his master, arrested, he knows not on what charge. While Luciana hastens off to procure the ducats, the wife, questioning the servant, learns that something has been said about a chain. She has not, however, been able to discover any more, when her sister returns with the money, and Dromio hurries off to free the prisoner he takes for his master. The curtain next rises on a public square, where the Syracusan wonders because almost every man he meets calls him by name, invites him, or offers to sell him some commodity. When his servant runs up, delivering the Ephesian's gold, the master wonderingly inquires what it means, and thinks his man must be distracted when he reports seeing him a while ago in custody of an officer. Charitably concluding they are both suffering from delusions from which they will be freed only when they have left Ephesus, Antipholus prepares to depart. But, before he can do so, the courtesan, with whom his twin brother has been dining, rushes up demanding the chain he wears around his neck, which was to have been given her in exchange for her ring. When the Syracusan gravely denies having dined with her, received a ring, or promised her a chain, fearing lest she may receive no equivalent for her token, the courtesan gives vent to such anger that master and man flee. Left alone in the square, the irate courtesan decides that Antipholus must be mad, else how could he deny dining with her. Besides, she remembers that the story he told of his exclusion from home sounded suspicious. She, therefore, determines to claim the promised chain from Antipholus' wife, telling her that her husband, in a fit of mental aberration, rushed into her house and bore off her property! We next see the Ephesian walking along the street with his guard, promising not to escape, but soon to satisfy all claims with the money his servant will bring. He accounts for the delay by stating his wife has been in a wayward mood lately, and seeing a Dromio appear, naturally deems him the servant he sent in quest of the ducats, as well as to purchase a rope. When the Ephesian master demands his money, the man replies there was no change, and delivers his purchase. Thereupon numerous questions, a beating, and considerable abuse ensue, the servant truthfully insisting he has never been sent for money, but for a rope. It is just at the end of this misunderstanding that the Ephesian's wife, her sister, the courtesan, and a physician appear upon the square. The women are bringing this doctor in hopes he can perform some conjuring tricks, whereby Antipholus will be freed from the evil spirit which makes him deny his wife and bestow gifts upon strangers. On perceiving the excitement to which the Ephesian is a prey, they naturally conclude it is a symptom of insanity a conviction heightened by his striking the physician, who tries to feel his pulse. Finding this patient possessed by so evil a spirit, the physician begins his conjuring, only to be rudely silenced by the Ephesian, who accuses him of abetting his wife in locking him out of his house. This statement causes Adriana to exclaim her husband must be mad indeed, seeing he dined at home, appealing to her servant and to Luciana to confirm her words. But, whereas the servant readily testifies he and his master were locked out, Luciana vows both were at home, one dining, the other acting as porter. As Adriana goes on to explain that she has just given Dromio the required bag of gold, the man indignantly denies it, protesting he has not been back to the house, and thereby increasing the confusion. In his anger, the Ephesian now shows such violence that Adriana signals to men lurking in the background, who rush forward and bind him fast, to prevent his doing himself any harm. It is while the Ephesian Antipholus is being thus secured that the officer refuses to give him up, unless paid for the chain, money which Adriana is ready to disburse. Meantime, the courtesan clamours that this chain was to have been given to her in exchange for the ring on Antipholus' finger. While the Ephesian is led away bound by doctor and attendants, his wife, the courtesan, and officer discuss this affair, until the Syracusan suddenly dashes past them with drawn sword, closely followed by his servant. Owing to the resemblance between masters and men, Adriana thinks her husband has become a raving maniac, and flees screaming, her actions causing the fugitives to pause and recognise her. Deciding it best not to remain in a town where they are likely to be claimed as husbands by women whom they do not affect, both long to depart. The fifth act opens in a street before a Priory, where the merchant and goldsmith are conversing, the latter apologising for keeping the former waiting for his money, saying it is strange Antipholus should deny receiving the chain, as he has hitherto enjoyed an enviable reputation for honesty. They are interrupted by the appearance of the Syracusan Antipholus and his servant, the former wearing the chain in question round his neck. As this seems insult added to injury, the goldsmith hotly reproaches his supposed patron for denying having received his wares a denial the Syracusan refutes, although the merchant asserts he overheard it. To be accused of such baseness so irritates the Syracusan that he challenges the merchant, with whom he is just beginning to fight, when Adriana, her sister, and the courtesan rush upon the scene, the frantic wife imploring the merchant to spare her mad husband, and calling upon her followers to bind fast master and man, and take them home. Terrified at the prospect of such a fate, the Syracusan servant hastily advises his master to seek sanctuary with him in the Priory, into which both rush, and from whence the Abbess soon emerges to forbid further pursuit. When Adriana tearfully explains that they have come in quest of her maniac husband, whom the goldsmith acknowledges not to be in his right mind, and whom the merchant regrets having challenged, the Abbess demands how his insanity revealed itself. The unhappy wife then states that, although Antipholus has met with neither loss nor sorrow, his frequent absences from home have caused her anxiety. Her answers to the Abbess' questions so plainly reveal her jealous recriminations have been almost incessant, that the holy woman soon pitifully declares a wife's jealousy has driven Antipholus mad. She, therefore, refuses to let Adriana see her husband, declaring that, because he has taken refuge with her, she will defend him, making use of her skill to restore his health and mind. Then, notwithstanding Adriana's recriminations, she vanishes within the Priory gates. The Abbess having gone, wife, sister, goldsmith, and merchant decide to petition the Duke to interfere in their behalf. The merchant avers they can easily do so, since the Duke is due here within the next few minutes, to witness the execution of the old Syracusan merchant, who has been unable to raise the required fine. All, therefore, decide to linger in this neighbourhood until the Duke arrives, when they intend to fall at his feet and beseech his aid. A moment later the Duke appears with his train, and the heralds proclaim the prisoner must die unless his fine be paid. Rushing forward, Adriana falls at the Duke's feet, hysterically demanding justice against the Abbess, a request which amazes him, as a lady of such holy repute cannot have done wrong. But, on hearing Adriana explain what has happened, the Duke, who is deeply attached to Antipholus, immediately promises to investigate the affair. It is at this juncture that a servant rushes in, calling to Adriana to save herself, and reporting that master and man, exasperated by the doctor's treatment, have broken bounds and are at large. That is no news to Adrfana, who, therefore, treats the man with contempt. But a great hue and cry induces the Duke to call upon his guards to protect the women, and, glancing down the street, Adriana is amazed to behold the husband, whom she thought in the Priory, but whence he has since doubtless escaped by magic arts. Rushing forward, the Ephesian and his man implore the Duke to protect them, just as the prisoner exclaims that, unless the fear of death has dazed his mind, he beholds his missing son, Antipholus, and servant, Dromio. The Ephesian, who has no recollection of his father's face, fails, of course, to recognise the prisoner, to whom he pays no heed, entering instead a formal complaint against his wife, who has closed his doors upon him, and revelled during his absence. These accusations Adriana and Luciana hotly deny, insisting that he dined in private with them. The Ephesian now angrily adds he is accused of receiving a chain never delivered to him, summoned to pay for what he has not received, and arrested and treated like a madman, because he will not yield to the vagaries of those around him. Hearing this, the Duke cross-questions the goldsmith, who confirms Antipholus' statement that he was locked out of home, but insists he gave him the chain he saw a moment ago upon his neck. The merchant also vows he saw the chain; and, unable to restrain his curiosity, inquires how Antipholus escaped from sanctuary. When the Ephesian testily denies ever having been within the Priory walls, as well as all knowledge of the chain, which the courtesan claims, the Duke comes to the conclusion that all present are mad, for none of his questions elicit the truth. He has just sent a servant to summon the Abbess, - by whose aid he hopes to solve the mystery,- when the prisoner, stepping forward, announces that, his son being there to pay his ransom, he can now be liberated immediately. Allowed to explain, Egeon asks Antipholus whether such is not his name, and whether his servant is not Dromio; but, although the Ephesian admits such is the case, he denies ever having seen the prisoner, who concludes grief has made him unrecognisable. In his despair, Egeon appeals to the servant, who, like his master, denies all knowledge of him, and confirms Antipholus' statement that his father was lost at sea. When the prisoner states that Antipholus lived with him in Syracuse for eighteen years, the Duke himself contradicts him, as he has known the Ephesian all his life. Then, imagining the old man must be doting, he is just bidding him cease advancng foolish claims, when the Abbess appears, followed by the Syracusan Antipholus and his servant. Advancing with dignity, the Abbess begs to place under ducal protection a wronged man, and all present start with amazement when they behold two masters and two servants so exactly alike that none can tell them apart! All present express surprise, Adriana thinking she sees two husbands, and the Duke wondering which is the mortal man and which the spirit, as it doesn't seem possible two human beings could be such exact counterparts. Startled at coming face to face, the two Dromios, in sudden terror, implore the Duke to send the other man away, each claiming he is the only genuine bearer of the name. Meantime, the Syracusan has no sooner caught a sight of the prisoner, than he joyfully embraces him as father, a recognition his man confirms. To everybody's surprise, the Abbess also announces he is her long-lost husband Egeon, relating how, after she, one son, and one slave were rescued, the children were taken from her by cruel pirates, leaving her so bereft that she entered a nunnery, where she has dwelt ever since. This explanation reveals to the Duke that there are now two Antipholuses in Ephesus, as well as two Dromios; so, to avoid further confusion, he bids masters and servants stand far apart. Little by little it then becomes clear how the Syracusan and his servant came to town and dined by mistake with the Ephesian lady, who has been claiming her brother-in-law as husband. The goldsmith admits that the chain he fancied having given to the Ephesian, was, on the contrary, delivered to the Syracusan, who, never having ordered it, could not be held responsible for its payment. When the Syracusan produces the bag of ducats brought by his servant, saying he cannot imagine whence they came, nor why they were given him, the Ephesian joyfully claims his property, and offers to pay for his father's release, which is no longer necessary, as the Duke has pardoned him. Last of all, the courtesan claims her ring, which the Ephesian cheerfully returns, having borrowed it merely to tease his wife. These points being settled, the Abbess invites all present to the Priory, where she intends to celebrate the joyful reunion of parents, sons, and servants. All, therefore, follow her, save the two Antipholuses and Dromios, whose resemblance is such that, owing to a slight shifting of position, the Syracusan servant again addresses his master's brother by mistake, offering to remove his luggage from the ship in which he wus about to sail. For a moment the Ephesian master is again deceived, but his error is soon rectified by his brother, and the twin masters leave the scene together, leaving the two Dromios face to face.